Ann and Frank McGuyer were familiar with Texas Children’s Hospital and its reputation in the community, but their personal interest increased when their daughter received outstanding care at Texas Children’s Pavilion for Women. They were particularly grateful to Obstetrician and Gynecologist-in-Chief, Dr. Michael Belfort, and wanted to find a way to support one of his areas of expertise—and his passion: development of devices designed and right-sized specifically for babies. They decided to fund an endowed chair for Dr. Belfort because they knew it would be a great tool for him to advance his groundbreaking research. Endowed chairs are our most powerful tool in bringing the world's leading experts to Texas children's Hospital and keeping them here — to provide the most specialized care, train the next generation of physicians and researchers, and conduct the groundbreaking research that will result in better treatments and even cures. Once an endowed chair is in place, the chair holder has access to significant funds to provide support to launch or advance initiatives in all these areas. 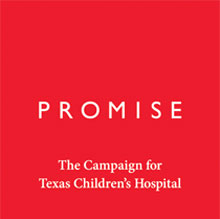 Funds raised through Promise: The Campaign for Texas Children's Hospital will include dedicated funding that will increase the current number of endowed chairs. The talented physicians, surgeons and scientists at Texas Children’s Hospital are at the core of our medical care, education and research missions. These world-renowned experts are among the world’s elite in pediatric medicine — and our patients and families deserve nothing less than the best. Through the generosity of donors to Promise: The Campaign for Texas Children’s Hospital, $18.4 million was raised for endowed chairs.